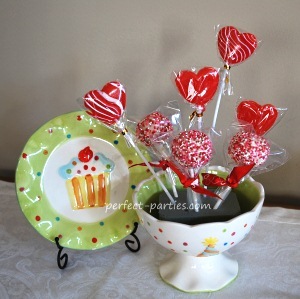 Using a box cake mix and frosting, form balls, attach lollipop sticks and dip. Add sprinkles if you desire and wrap in gift bag and ribbon. Create a fun centerpiece or send home as party favors. Bake cake as directed on the box. Cool completely. Cut into fourths and remove two quarters. Gently rub cake quarters over bowl to create crumbs. Large pieces simply break up with your hand. Repeat with other half of cake. Add 3/4 can of the frosting to your cake crumbs. Add more only if needed. Mix well with spoon or hand. Use scoop to measure and roll into a ball or if you don't have a scoop, roll with hands into quarter sized balls. Place on waxed paper. Chill for a couple hours in the refrigerator or place in freezer for a short while to get firm. Add a few drops of pink food coloring until you have the desired pink. Mix well. Dip lollipop stick into the melted chocolate and insert into cake ball a little less than half way. When the stick is firm and set, dip into chocolate and remove promptly. You can use a small spoon to cover areas missed but do NOT swirl pop in the chocolate or you will lose it. Gently tap the stick or your hand holding it and let cake pop drip the excess chocolate off. If you tap the stick too hard or too much, your cake will fall off. Rotating the stick gently as you tap the stick will help make a smoother coating all around. Add sprinkles if desired and candy on top. We found by doing it with a small bowl (2 inch diameter) inside, it was easy to pinch and sprinkle and catch it in the second. Then while holding the lollipop stick, poke it into styrofoam block to set. If pops are starting to drip, place block in refrigerator to set. This pot made this so much easier! 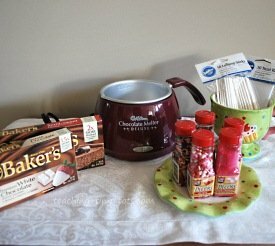 I'd definitely recommend getting this Wilton Chocolate Melting Pot if you enjoy dipping pretzels, strawberries and make cake pops. The metal portion or the pot will get hot so adult needs to be constantly monitoring. Do not use WHIPPED frosting. Add 3/4 of the can first. Too much will make it too hard to work with. Leave plastic covering on styrofoam if you buy a new one, it is easier to clean if you have any drips. This takes a little practice and if you lose a few off the stick...make truffles! They taste just as good! Add a flag or cut out circles in cardstock, punch a hole and add a theme sticker on each, tie with ribbon to the stick of the lollipop.